Aer Lingus's new crisp sandwich is proving a hit - particularly on Spanish routes - since its introduction last week. Demand for the snacks, which include Tayto crisps, Kerrygold butter and two slices of bread, is "sky-high" according to the airline. They were introduced last week as an addition to its new in-flight bia summer menu on short haul and European flights, and are priced at €4/£3. The sandwiches have been particularly popular on Spanish routes including Malaga, Barcelona and Alicante, where there are traditionally a lot of young families jetting off on summer holiday, Aer Lingus says. UK routes too, most notably weekend flights, are also seeing strong demand. “It’s fair to say the crisp sandwich has experienced a bit of a revival in recent months following the Tayto pop-up shop in Dublin as well as a dedicated crisp sandwich café opening in Belfast," said Sinead O’Neill, Retail Manager with Aer Lingus. "So we recognised there was a definite demand for the product." “Tayto crisps evoke a taste of home that we all know and love, stemming right back to childhood and there is a certain nostalgia associated with it," she added. 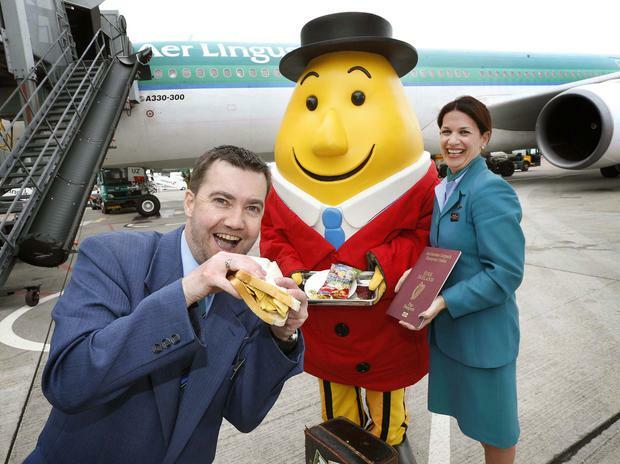 Many of the fresh sandwiches and snacks on the airline's bia menu were created in collaboration with celeb chef, Clodagh McKenna, though it's likely Mr Tayto had more of a hand in this one. Is airplane food finally getting tasty?